Robert Thurman (1941–), American author, editor and translator of books on Tibetan Buddhism, Je Tsongkhapa professor of Indo-Tibetan Buddhist Studies at Columbia University and co-founder and president of Tibet House U.S.
↑ "World's Tallest Walking Buddha". Buddhist Door International. Retrieved 3 April 2015. 1 2 3 4 5 "Top Ten celebrity Buddhists". Wildmind Buddhist Meditation. Wildmind.org. June 5, 2007. Retrieved August 9, 2011. ↑ "Hank Johnson, Congressman and Buddhist". About.com. December 14, 2009. Retrieved July 19, 2012. ↑ "South Korean nun ends 100-day fast for salamander". Daily Times. 5 February 2005. Retrieved 11 January 2012. ↑ Lawrence, Ken (January 30, 2001). "Barthez looks like a Buddhist with a blind spot". ESPN. Retrieved March 6, 2016. ↑ "Italy legend Roberto Baggio opens biggest Buddhist Centre in Europe". Forza Italian Football. October 28, 2014. Retrieved March 6, 2016. 1 2 3 4 "Top Ten celebrity Buddhists". Wildmind Buddhist Meditation. Wildmind.org. June 5, 2007. Retrieved August 9, 2011. ↑ Carlisle, Belinda (2011). Lips Unsealed: A Memoir. Three Rivers Press. p. 222. ISBN 9780307463500. ↑ "Buddhism makes for a happy celeb!". Daily News and Analysis. October 16, 2012. Retrieved March 6, 2016. ↑ "Chow Yun-Fat biography and filmography: Dragonball: Evolution Actor". Tribute.ca. Retrieved August 9, 2011. ↑ "Penelope Cruz: I want to grow old gracefully like Sophia Loren". Daily Mail. August 28, 2009. Retrieved March 6, 2016. ↑ Dvorsky, George. "George Dvorsky: About". Google+. Retrieved August 30, 2011. ↑ Morgan, Bill. I Celebrate Myself: The Somewhat Private Life of Allen Ginsberg. New York: Viking, 2006. ↑ Silberman, Steve (October 28, 2011). "What Kind of Buddhist was Steve Jobs, Really?". NeuroTribes. Retrieved January 6, 2012. ↑ Burke, Daniel (November 2, 2011). "Steve Jobs' private spirituality now an open book". USA Today. Retrieved January 6, 2012. ↑ Ginsberg, Allen. "Negative Capability: Kerouac's Buddhist Ethic". 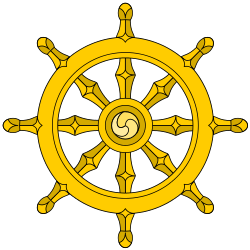 Tricycle: The Buddhist Review. Retrieved March 6, 2016. ↑ "The second coming of kd Lang". The Times. London. January 13, 2008. Retrieved May 8, 2010. ↑ "How did you come to follow Tibetan Buddhism?". The Official Jet Li Website. JetLi.com. May 21, 2001. Retrieved August 9, 2001. ↑ Lash, Jolie (18 November 2005). "Enduring Love". The Guardian. Retrieved August 9, 2011. ↑ "Soka Gakkai International's 'Buddhist in America' Videos: The Spiritual Heart on Camera". Buddhist Door. 2015-05-23. Retrieved 2014-08-08. ↑ Dart, John (February 1, 1986). "Astronaut Remembered as First Buddhist in Space". Los Angeles Times. Retrieved March 6, 2016. ↑ Palladino, D. J. (September 28, 2006). "Peony Dreams". The Santa Barbara Independent. Retrieved August 9, 2011. ↑ Solomon, Deborah (January 20, 2008). "All in the Family". New York Times. Retrieved March 6, 2016. ↑ Lagrossa, Edward (October 20, 1997). "Stone Soul Booksigning". The Austin Chronicle. Retrieved August 9, 2011. ↑ Lee, Luaine (October 17, 1998). "Sharon Stone's now at peace with her world". Deseret News. p. 2. Retrieved August 9, 2011. ↑ Altman, Alex (November 6, 2008). "Q&A: George Takei on Prop 8". TIME. Retrieved August 14, 2010. ↑ Wright, Robert (July 24, 2000). "Gandhi and Tiger Woods". Slate.com. Retrieved August 9, 2011. ↑ Littlefair Wallace, Sam (August 13, 2015). "Actor Michelle Yeoh blends Buddhism & activism". Lion's Roar. Retrieved March 6, 2016. ↑ Warehouse 13 (Season 3, Episode 1) "The New Guy"
1 2 3 The Simpsons Episode 275 (Season 13 Episode 6) "She of Little Faith"
↑ "Religion of Hiro Nakamura; from Heroes (TV series): Season 1, Episode". Comicbookreligion.com. Retrieved 2012-01-31. ↑ South Park Episode 58 (Season 4, Episode 11) "Probably"